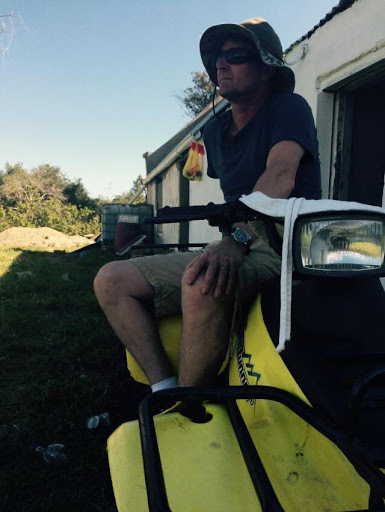 One of my favourite “tools” on the farm is our little 160cc Suzuki quad bike. My friend Eldred had it lying around in his garage and gave it to us as a gift when we first bought the farm. What I like about it is that it’s small and light, but powerful enough to take a load of fence poles or drag a log out of the dam. Having a big fancy John Deer tractor would be great, but very expensive, so right now we make do with what we have. The heavier puling tasks the quad bike can’t handle, I use my 4X4 for. The big digging and pushing tasks I hire in a TLB at R300.00 per hour. No, it’s not ideal, but I am working within the realistic limitations of what we have and how best we should invest what we have. And what’s more, the quad bike is agile, it has a tight turning circle, it can manoeuvre through narrow paths in the forest. Places where a tractor just could not get right now. The quad bike is also light on the ground, it will not easily compact the soil or sink into muddy patches. Oh yes, and of course, it doubles as a toy. I feel quite comfortable to let even smallish children take turns up and down the driveway on the quad bike. I would not be able to let them do this with a tractor. My policy favouring a quad bike (for now) over a tractor I suppose comes out of a long tradition where my grandfathers’ grandfather would have had to make such conscious choices all the time. My grandfather’s grandfather would have lived on a farm; he would have known that if he invested too heavily in extravagances he would struggle to feed his family. If that meant walking to town because he could not yet quite afford a horse cart, then I guess that is what he would have done. If that meant housing is family in a one roomed cottage, that is what he would have had to do. That’s just the way things were, and actually that’s still the way things are. Our modern urban lives have helped to blur the lines between what is possible and what is impossible. Banks and other credit giving business have created the illusion that we can have anything we want right now. All we have to do is sell our future lives to them. All we have to do is to agree to labour for them. So we buy the horse cart, or the three roomed cottage or the tractor, but we sell the very thing we were trying to attain by entering into the bargain. Let me be clear. In some way or other, we are always trying to be free. When we buy something or build something it is in order that we may be free. Free from discomfort, free from toil and struggle, free from inconvenience. We are always trying to buy our freedom. The banks and credit giving institutions know this, but also know that we have become conditioned to selling our very freedom, our future time and energy for the privilege of having right now what we actually can’t afford to have right now. The debt trap has become so common and so widespread that it has become generally accepted that this is the route any young person should follow when leaving home and embarking on their journey to independence. Young people who do not go into debt to buy cars, clothing and big screen televisions risk becoming social outcasts. There are the brave ones that do resit the trend, but these are a very small, very courageous minority of thought leaders. I must be careful to clarify that I am not speaking out against debt as a concept; I am speaking here about moving toward some acceptance that debt is a very powerful and at the same time a very dangerous tool. Clever people have learned how use debt to invest well and build empires that serve them and their families for generations. But debt is dangerous. Like dynamite. Not something to hand out an street corners to children , but something to entrust to experienced miners who after years of training, know how to apply its force surgically and precisely to extract the ore from the rock. Right now, we are suffering a pandemic of indebted , young and old, running around dazed through the city streets with sticks of dynamite blowing off hands and limbs. I am not saying that buying a tractor is a bad idea; I am not saying that debt is a bad idea; I am saying that we must be become skilled before making decisions so that we are not tricked into selling the farm to buy the tractor. Very well put Tim. I've learnt and am still learning that for Dept to work it must be planned for a nd the repayments must be affordable. When I 1st worked for Sindile (thanks to you) I applied for a bond. The banks were alot less cautious back then. The repayments on the bond they offered were actually unaffordable on my salary at the time!!! Thankfully I did not pursue it. @Ivan. What I see so much of is that we commit so much of our time. (our lives actually) to the project of paying for what we want for our lives. We sell our freedom in order to pay for the things we believe will make us free. How do we get out of this pattern? @Tim – I'm pretty sure you're already on the road to getting out this pattern. ~ do what you love & that will be varied activities. ~ make sure that what you love can sustain you via money earned or food grown etc.. but then you've already started it. ~ If you're in the position, which you are (at NOH), empower others to flourish. (seriously have a look at the Ricardo Semler at SEMCO example) It frees you up & everyone benefits!